Club Penguin Cheats by Mimo777 Club Penguin Cheats by Mimo777: New Mimo Club Penguin Contest! Random Mimo! It's been uber long since we've had a REALLY warped Mimo contest! This will be a good one! Make a Mimo777 penguin out of anything random! Remember WAAAAY back we had a make Mimo contest out of food? If you missed it click here to check it out. It was EPIC! So let's to that again only this time YOU CAN MAKE A MIMO OUT OF ANYTHING! For example make a Mimo out of paperclips, duct tape or even soap or dirt! 1. You must make Mimo out of something totally random! 2. Take a picture of your Mimo. 4. Name your email "CREATE RANDOM MIMO CONTEST!" 5. Tell us what your Mimo is made of. 6. 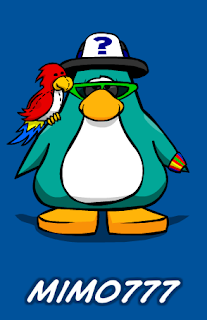 MAKE SURE YOU SEND YOUR PENGUIN NAME WITH THE PICTURE. 7. Mimo and CPG will post the several of best most CREATIVE ones and let you HELP us pick the big winner! But it will be fun! Give it a try! Be creative! Be weird! I also need a good prize for the winners. Any ideas?! Here is the first REALLY good entry! i think the prize should be a free six month membership,or a free coin code. Nvm not the puffle hat idea. Maybe a secret mimo halloween party... and while the party is on u will add the winners! 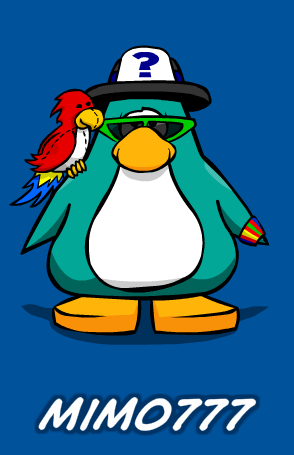 The prize should be on of the new puffles with the hats. A coin code, definately. If not, a membership. guys how would mimo give the winner a club penguin plush toy? What about a month free membership? It's only a prize doesn't mean it has to be worth something? IMPORTANT QUESTION: when are these due? A puffle hat toy of their choice! hey mimo please can you put on a party that is no contest plus show it on UK time so people like me in the UK will know! Plus your prize for the comp could be.. hmmm.. I know! A Ps3 slim for the winner and a PSP Vita for the runner up! LOL i'm just kidding! It could be a chance to meet mimo and be his buddy! PLEASE can you do a sonic the hedgehog contest where you have to draw sonic on paint since it is a challenge and paint is a hard drawring program! Plus I think that sonic is awesome! If you did not know, a new sonic game is coming out next month for the PS3, Xbox 360 and the 3DS! There will be loads of winners and each of them will attend at your party plus the best winners will recive a 1 month membership so they can dress up like a sonic character! Also if the picture is too big, you can just put on a link so when the people click it they will see the picture! You can also draw the classic sonic and modern sonic all together! can you sewa mimo? I may be a boy, but its the only thing i can think of, and my grandma taught me. mario30206, Mimo777 cant afford to spend 40 bucks on a 6 month membership for us. That is a waste of money.The prize will be probably adding Mimo to your buddy list,1 toy code,and being posted on the blog. I think you should put a 2 free coin codes or a membership! If you already are a member you can't win so that way the non members can get a chance to try being a member I have wanted to be a member for ever. Two toy codes- free of course -and 10000 coins. Note: we need the toy codes usable for the treasure book!!! 1month membership... membership is getting expensive!! Anoynomous, its not fair to leave people with memberships already out! whoever wins the contest shall proabaly get 1 month membership,mimo777s friendship,and posted on blog. Whoever wins,wins. 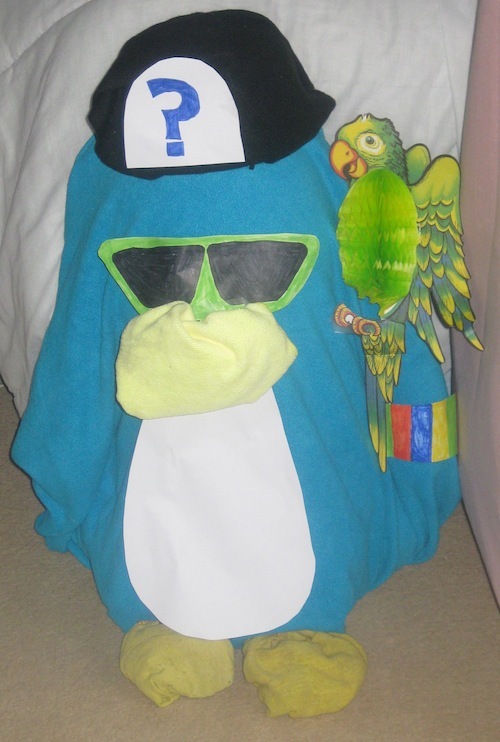 mario30206, yes mimo would give a club penguin plush toy! great idea! How would he because we don't know where the others live and we can't tell! Sorry, Mimo doesnt do these. When he has a party, just convert the time he says to your time. I Think maybe umm, mimo adding you and having a SECERET party! Anonomous? 100 year membership is over 500 bucks. soo uh no. good try though! Anonomous, thank you for the idea of sonic the hedgehog! i will take that into consideration. Um... something nice like umm a MIMO777 shirt or like metting Mimo in real life!! Can you do a contest where people have to say what they think the sega dreamcast 2 will be like? They can draw it and in the email show the features! do you even know mimo or are you going to just email him or somehow make him know? Also it is the one who posted the sonic comp idea. Surely not a coin code! I just got one for SERIES 9! (Will the Ladybird penguin work for series 9?). ~~~~~~~~~~~~~~~~~~~~~~~~~~~~~~~~~~~~~~ Not a membership because you need to let members win like me because I really want to enter! DON'T BE MEAN!!!!! hey mimo, i think that the 7 winners should have a coin code each which accesses a really cool treasue book!